If you want to have a small business website then you need to know how to choose a hosting service. What you want to do with your website will have an impact on your choice of hosting service. For a personal or hobby site you can most likely get by with a free hosting account. If your site is for your small business then you should definitely be looking at a more robust option for a hosting service. Let’s look at what you should consider when choosing a hosting service. Step one is to map out what you want to accomplish with your website prior to deciding on a web hosting service. Is it just an informational or brochure site? Are you going to sell products? Will you have a premium content area or membership area? Do you need special software for your website? Are you going to host multiple websites on the same account? How much traffic do you think your website will get? 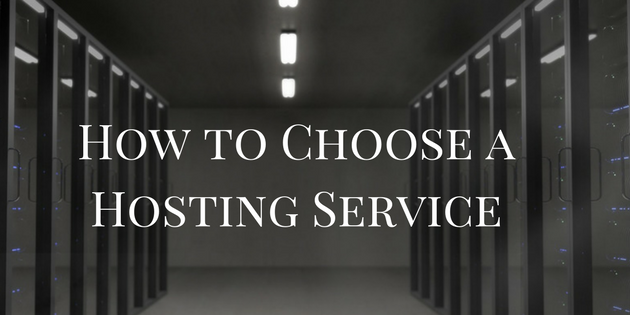 All of these questions are critical when figuring out how to choose a hosting service. Once you have the answers to these questions you get started comparing plans and companies. What are the Different Types of Web Hosting Plans? A shared hosting plan is exactly what it sounds like. Your website is sharing space on a server with other websites. Shared hosting is the most affordable and most popular option for new websites and informational brochure sites. The down side to shared hosting is you can find yourself at the mercy of other websites on the same server. If there is a website that hogs resources it can slow down the speed and performance of your site. The cost is however the biggest reason to start out with a shared hosting plan. In most cases you are going to pay between $5-$20 per month for a shared hosting plan. A VPS or Virtual Private Server is a virtual installation of server software on a physical machine. While you have your own dedicated server, it is housed on a single physical server with other VPS installations. This is often the next step for sites that outgrow the shared hosting plan. If you are going to sell products or your traffic is beginning to increase a VPS may be a good solution. The main advantage of a VPS is that you have control over the operating system of the server. Why is this important? This allows you to configure the VPS to meet specific the needs of your website. For instance you can host additional services a mail serve, File Transfer Protocol or specialized databases for e-commerce. VPS hosting plans range from $20-$60/month. Cloud hosting consists of a network of multiple serves that create a cloud where multiple servers reside. The advantage of cloud hosting is that it is scalable. This type of plan can handle massive surges in website traffic without shutting down your website. This plan is great for quickly growing companies who may need to customize the backend of their site or add custom services to their server. Cloud hosting is generally faster and more secure as it mirrors you data across multiple servers. Cloud hosting ranges from $7-$25/month. With a dedicated hosting plan you have your own physical server. Dedicated servers are often the fastest, most powerful option for hosting. One of the most attractive aspects of having a dedicated server is that it is generally under the complete control of the customer. Hardware can be customized and all the resources of that server are 100% devoted to you. This service plan would be for larger companies, businesses that have complex custom sites or a regular high volume of traffic. Dedicated hosting is a bit pricey and ranges from $80-$120+/month. What Kind of Web Hosting Control Panel Does the Hosting Service Offer? This is one the most important factors in choosing a hosting service. The web hosting control panel is the user interface for your hosting service. There are several control panels such as cPanel, Plesk, vDeck and DirectAdmin. The most popular is cPanel. Whatever control panel your hosting service uses, you need to make sure it creates a user friendly environment especially if you don’t have experience with hosting. What Additional Services Does the Hosting Company Provide? Most web hosting plans will provide some additional services. Sometimes these services are extra but with a business it’s usually worth it. Here are a few services you should be looking for. Most hosting companies provide a once WordPress installation. This is a must for someone new to building and managing a website. If this service isn’t included, don’t even consider that web hosting service. If you have a business then you definitely want to have emails with your domain name. For example, my email here is steve@starknakedmarketing.com. This is important for both brand recognition and makes your business look more professional. Security should be a high priority when building a website. There’s nothing worse then having a great website that produces sales and it gets hacked. Iif you are going have any kind of e-commerce site be sure you have a secure server using https:// so your customers can carry out transactions on your site. If you are serious about making money with your website than you need to monitor your websites statistics. Number of visitors to your site in a certain time frame. Number of page views by page. Time spent on your site or on specific pages. The bandwidth usage of your site. These and many more statistics are useful in determining the effectiveness your website. I’m sure if you’ve ever worked on a computer you have spent hours working on a document or spreadsheet only to have your machine crash and lose everything. This pales in comparison to losing an entire website. Getting your site hacked or having an update crash your site is aweful. But… it doesn’t have to be catastrophic. If you have regular backups of your website (I recommend weekly), then you can save major downtime, headache and in some cases substantial cost. Make sure you have a way to backup your site on the server not just in WordPress. I also recommend you take that one step further and create an offsite backup in case your server crashes and you lose data on the server. All of my clients who host with Stark Naked Marketing are backed up on our server as well as in the cloud with Amazon S3. When you have a problem with your hosting service you want to be able to get a hold of someone. In my opinion customer service is the number one priority when choosing a hosting service. There are 2 things that I think about with regards to customer service. The first is how responsive customer service is to your requests. Can you get someone on the phone and how long does it take? The second is if the customer service and technical support people are knowledgable and pleasant. Are they able to resolve your issues successfully and quickly. I have been with Lunarpages for nearly 10 years and have had a really good experience. They have been responsive to any issues that I have had and I have had very few issues in those 10 years. The majority of my clients utilize Stark Naked Marketing’s hosting service which is based with Lunarpages. Basic shared hosting plans start at $4.95/month and include unlimited bandwidth and unlimited email accounts. Bluehost is one of the leaders in the hosting space. They offer unlimited bandwidth on all their plans along with 100 email accounts included in the Basic plan. Basic shared hosting plans start at $5.95/month (however they often have promotional deals as low as $2.95/mo for 36 months) and include unlimited bandwidth and 5 email accounts. Hostgator is another leader among web hosting services. This web host offers the same features as Lunarpages and Bluehost. Basic shared hosting plans start at $5.95/month (however they often have promotional deals as low as $3.95/mo 36 months) and include unlimited bandwidth and 5 unlimited email accounts. I recommend any of these 3 web hosting services. All provide good customer service and have very similar basic packages. If you need to look at the VPS, Cloud Hosing or Dedicated hosting dive a little deeper into the features each of these 3 hosts provide and compare prices. You can’t go wrong no matter which of these you choose. I hope you found value with today’s post learning how to choose a hosting service.